By Hazel Chua on 12/04/14 • Leave a comment! In this particular case, OC doesn’t stand for obsessive compulsive–it stands for Opening Ceremony. This limited edition jacket by Mophie is more than meets the eye, as it has a charger for your smartphone that’s concealed in one of its inner pockets. That way, you can look smashing and have enough juice to take a selfie because the charger will keep your phone all powered up. The jacket comes with a black and gold finish, and the charger is compatible with both Android and iOS devices, so you don’t have to worry about bringing adapters. There’s no shortage of multi-purpose and multi-functional tools and clothing in the market. 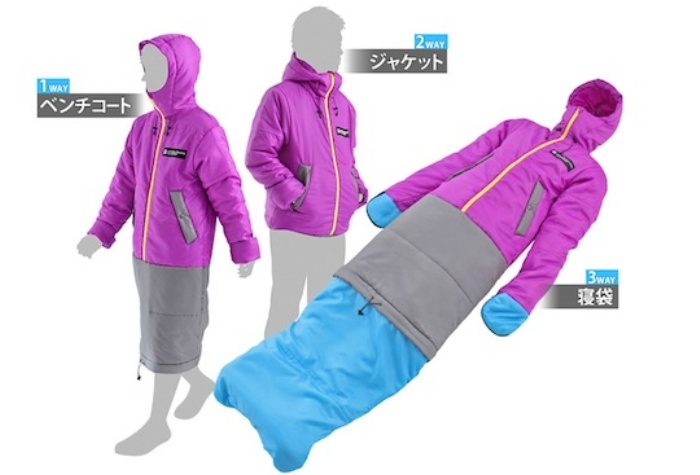 The latest one is called the Doppelganger Outdoors Wearable Sleeping Bag that’s currently being sold on Japan Trend Shop. 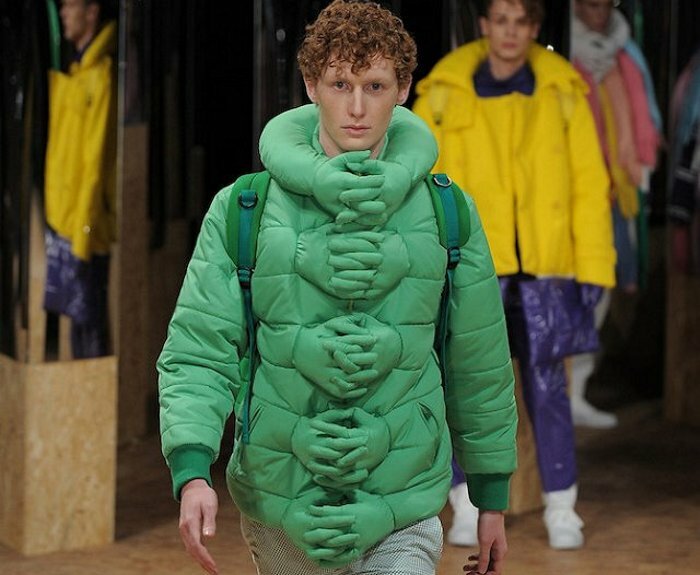 As the image above implies, the Doppelganger is a jacket, a coat, and a sleeping bag, all rolled into one nifty but silly-looking package. 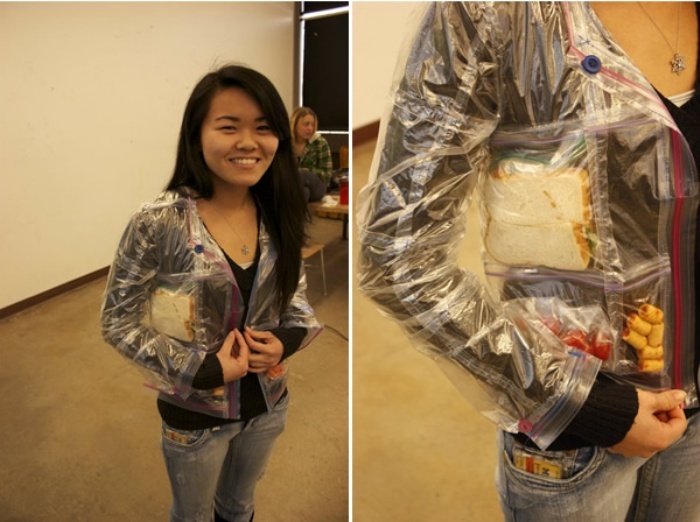 Strange appearance aside, it’s perfect for when you’re planning to spend some time in the great outdoors. The purple part is the jacket, which you can wear for some extra warmth or protection from the elements. Unzip the bottom part and the gray part of the jacket provides some extra leg protection. When you’re ready to go to bed, just extend the blue part and voila!–it’s now a sleeping bag. The Doppelganger Outdoors Wearable Sleeping Bag retails for $138. By Hazel Chua on 01/25/13 • Leave a comment! If you’ve ever tried to drink outdoors on a cold night, then you might’ve been able to make the unpleasant realization that it’s not as simple or easy as it looks. It’s too cold to grip the bottle using your bare hands, but it slips and slides when you try to hold it using the sleeve of your jacket. Then there’s the matter of trying to pop the bottle open with shaking and shivering hands. So do yourself a favor and swap out your regular jacket for the Drinkmaster Hoodie. It’s the only hoodie in the market that’s made especially for a drinker’s enjoyment. The Drinkmaster is fashioned from quality cotton and polyblend. 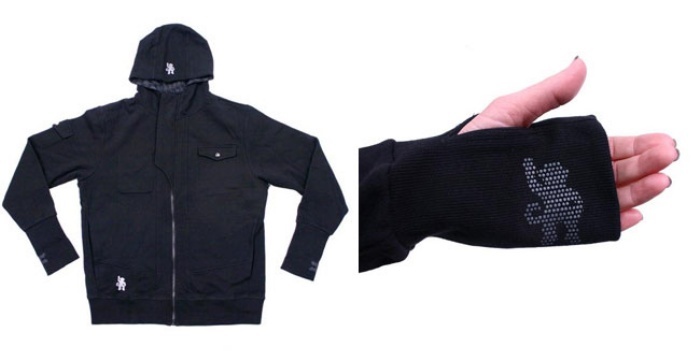 It has a built-in Neoprine-lined beer koozie pocket, a zipper with a bottle opener wedged somewhere in between, a flask pocket on the inside of the jacket, and built-in drinking gloves on the sleeve with a non-slip grip. It even has a snappable ID pocket so you can hand your ID over to buy your booze in a snap.